Located in a quiet cull-de-sac just 100 metres from world famous four mile beach.Newly renovated and refurbished three bedroom two bathroom large family home set in a private tropical oasis with lagoon style in ground pool. All modern conveniences including coffee machine, dishwasher, stone bench tops, large flat screen LCD TV with Austar, DVD, broadband Internet, air conditioning, spacious living and dining areas. With a great outdoor undercover deck area overlooking pool and gardens, Lorikeet on Coral is the perfect place to kick back throw some local prawns on the BBQ and enjoy a glass of wine and a good book. This is a large, well proportioned house with good facilities and a great outdoor area with pool and garden. It’s always going to be hot here, so adding an air conditioner in each bedroom (rather than the master plus lounge area) would be a bonus but didn’t stop us enjoying a great facility in a prime location. Good lounge areas and well equipped. Everything you need for a relaxing family holiday - close to the beach, shaded outdoor area and pool, quiet street and only a short drive into town. We have loved our stay and only wish we could stay a bit longer! we enjoyed our stay, house was perfect for all our needs. House was clean and matched photos well. Short drive into Port Douglas. Very short walk to beach. Fantastic house in lovely quiet street a stones throw from 4 mile beach. My family and I (group of 6) arrived late in the evening to find the house exactly as shown in the photos. It was well presented, clean and had all the amenities we would need for the week ahead. The pool was amazing and pretty much any free time we had between excursions was spent there. The layout is very nice for a couple of families with multiple seating areas inside and out. It is a short stroll to the beach and a short drive to the shops. 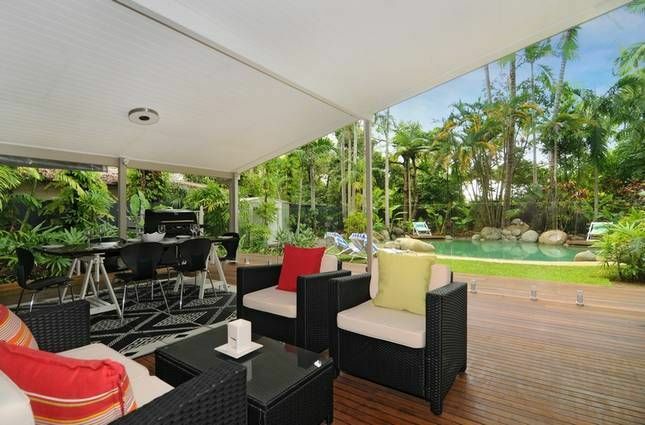 We had a lovely time at this house and would stay here again if we were visiting Port Douglas. The six of us, 3 adults and 3 teenage girls had a wonderful respite from the cold southern winter in this house for 2 weeks in July. It was spacious and clean. The backyard setting is so beautiful to look at with the natural pool and many palm trees. Great location with an easy walk to the beach. Wish we were still there.